Castel Monastero is an exclusive 11th Century property located just six kilometres away from the charming Italian town of Castelnuovo Berardenga in Italy’s Siena municipality. The hotel features mature gardens and old Tuscan houses dispersed around a central square (piazza), all surrounded by breathtaking countryside scenery. Inside the hotel are 74 well equipped and delicately furnished rooms and suites separated by typical frescoed walls and comprising of spacious and comfortable luxurious bathrooms. 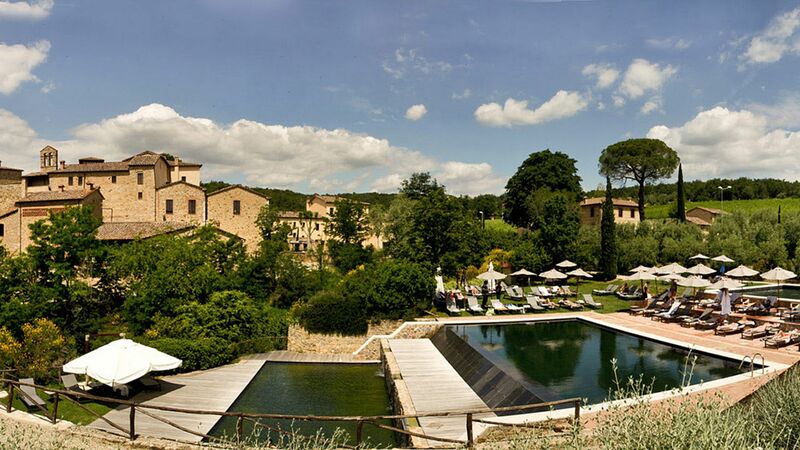 Each of the buildings reflects the unique and charming colours and style of Tuscany, not only through the design and furniture, but also through views over the green vineyards and woods surrounding the hotel. 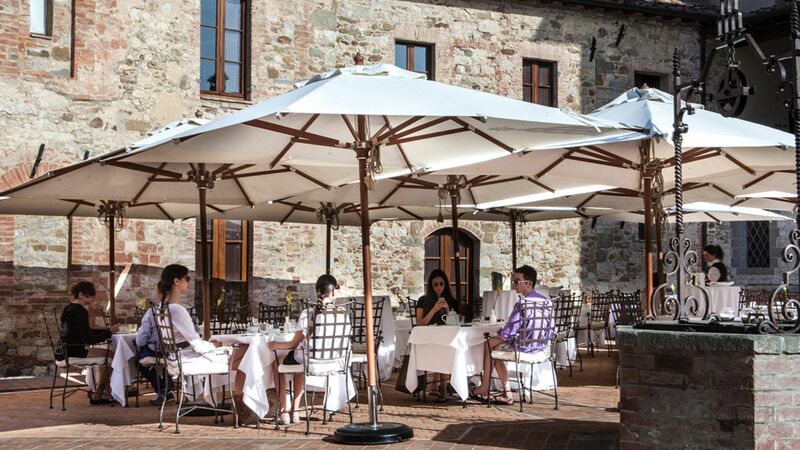 Castel Monastero’s leading restaurant, Contrada, celebrates Italian gastronomy and is occasionally directed by international celebrity Chef Gordon Ramsay. 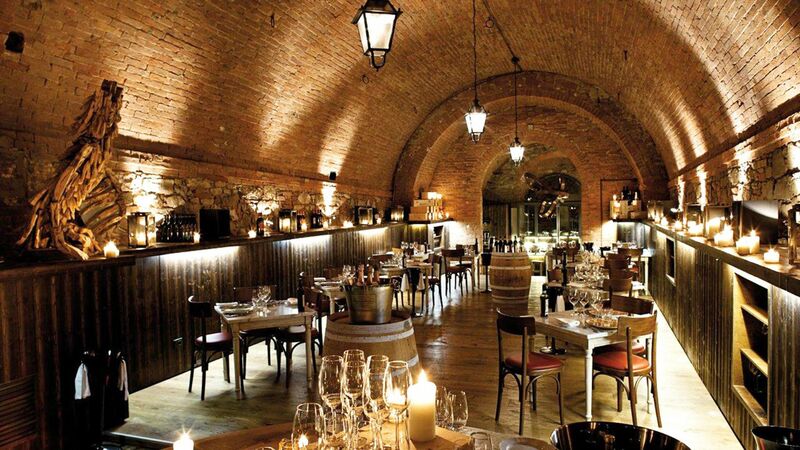 The hotel’s second culinary offering, La Cantina, is located in a centuries old wine cellar and serves the finest Tuscan specialties in a one of a kind surrounding of exclusive wine collections. Outdoor facilities including three swimming pools, a state of the art tennis court and wine cellars, and 16-acres of lands to discover. Facing the hotel’s central piazza (square) and offering authentic Italian traditional cuisine, Contrada is Castel Monastero’s fine dining restaurant which is occasionally supervised by Chef Gordon Ramsay. Open: For breakfast and dinner from Tuesday to Saturday. Located in the heart of centuries old wine cellars, La Cantina is a charming restaurant serving Tuscan gastronomic specialities in a medieval ambiance. Open: For lunch and dinner. Castel Monastero features three stylish swimming pools, each reflecting a unique atmosphere and set in a strategic location with beautiful views of the hotel and countryside. 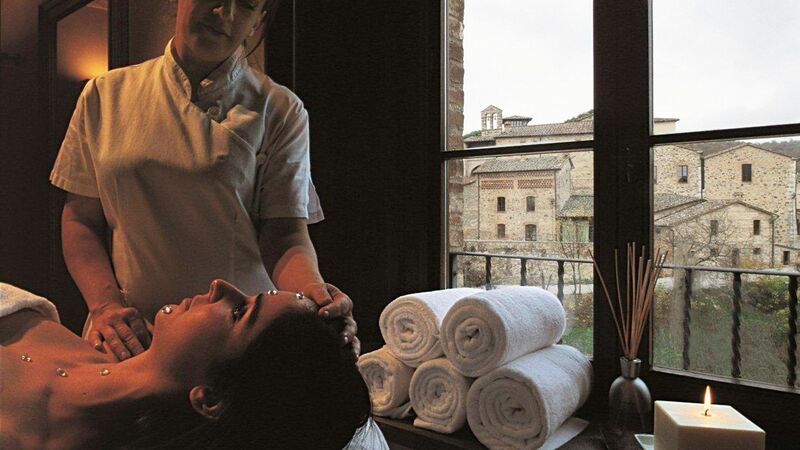 Luxurious spa facilities are available in two traditional Tuscan villas within Castel Monastero. Guests can choose from seven different packages suitable for individuals and couples. 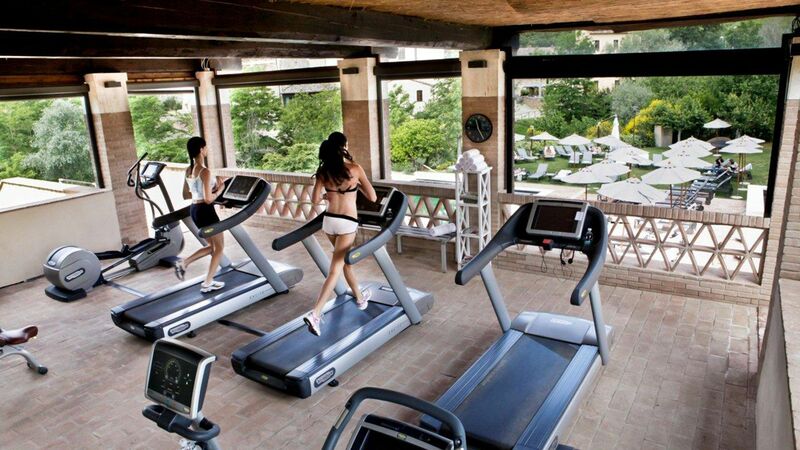 Castel Monastero’s gym is equipped with the latest technology and machines for guests who wish to remain active during their holidays. Personal training is also available upon request. This exclusive activity enables guests to enjoy a bird’s eye view of the Tuscan landscape. It’s perfect for couples wanting to enjoy a special romantic outing. Polo fans can enjoy the games at Villa Sesta Polo Club, which is located a few kilometres away from Castel Monastero. Castel Monastero’s Wine Tasting Program is an educative experience introducing guests to the Tuscan wine-making practice and history. Castelnuovo Berardenga is a 16th Century town just 20 minutes from Siena, where Tuscan restaurants compete against each other to attract gastronomy lovers, and authentic Italian wine bars pour native Chianti day and night. Castelnuovo Berardenga also has easy access to neighbouring hamlets such as San Gimignano, Monteriggioni, Sovana, Pitigliano and Volterra, the foundation of the Etruscan empire. There are many outdoor activities for Castelnuovo Berardenga’s visitors can enjoy, such as touring vintage Tuscan wine cellars, exploring fine art museums and historic buildings, and riding hot air balloons to watch the spectacular Tuscan sunsets. Cycling around the back roads of the village and discovering surrounding areas is a fantastic way to enjoy the beauty of Tuscany’s rolling green landscapes, especially during the spring and summer seasons. Castel Monastero is a two hour drive from Pisa Airport. Double Superior Rooms are decorated in traditional Tuscan country style. All rooms feature a bathroom with a bathtub and shower and magnificent views over the piazza di Castel Monastero or the surrounding countryside. Facilities include minibar, TV and complimentary wifi. Deluxe Double Rooms are decorated in traditional Tuscan style, featuring views over the piazza di Castel Monastero or the surrounding countryside. Prestige Double Rooms feature a bedroom with a small sitting area and a bathroom with a bathtub and separate shower and views over the vineyards or the medieval piazza. Junior Suites feature a bedroom with a separate lounge area and bathroom with a bathtub and shower and views over the countryside. Junior Suites feature a bedroom with a separate lounge area and bathroom with a bathtub and shower and views over the historic piazza. Executive Suites feature a bedroom and a spacious lounge as well as a bathroom with bathtub and separate shower and magnificent views of fields, vineyards and piazza di Castel Monastero. Save up to 15% on the hotel price for holidays between 01 - 31 July, 12 - 16 August and 01 - 30 September 2019. Lovely retreat after a busy few days in Florence. The spa at the hotel was perfect and so relaxing. The pool was also a welcome relief from the heat.. food was delicious and the staff were charming.. would highly recommend this hotel for a relaxing, spoilt weekend.. It is isolated in the hills so you will need a car to get around if you wanted to go for an outing, there?? ?s nothing within walking distance. We absolutely loved the accommodation and the entire experience we had from the moment we checked in with the lovely staff to all the beautiful details of the castel. The castel was so relaxing and quiet - a great opportunity to have a read and enjoy the sun by the pool or in the courtyard/piazza. The pool area was beautiful and the water so fresh and cold - nice and refreshing for summer. The staff at the pool were amazing as well we loved getting to know everyone. Breakfast was great :) All in all, it was the perfect place to unwind and end our 6 week European holiday. We left feeling refreshed. This place is a GEM!!! Loved the feel the minute we stepped out of our car. As we were escorted into the lobby, you see the gorgeous courtyard and immediately know you're someplace special. The staff greets you with the most gracious, warm welcome and the friendliness, warmth and service continues throughout the stay. It is beautiful, magical, wonderful. The rooms are amazing......you almost don't want to leave it because it is cozy, charming, very well appointed, and beautiful. The restaurants are amazing. You have to eat at both.....Contrada is something to remember! The staff was so professional and friendly. The spa is a MUST! The pool is quiet and beautiful. We just loved it all. Would return in a minute!!! As you just enter the hotel you feel like you enter a fairytale It?? ?s an old castle but the rooms are in a superior level !! The bed and amenities were amazing. On top of that the pool, spa and breakfast were at the highest level. But what made the difference were the stuff of the hotel. Would go back again for sure. I went for a week to relax with my partner. A friend recommended it and it has been better than I expected. The room was very confortable, the bed was big and confortable. Breakfast was varied and delicius. Every cor of Castel Monastero is a paradise to discover. Excellent quality/price. Highly recommended.